Device that collects solar radiation and heats a coolant, which in turn will be used in residential settings to heat water or the home. Collector’s insulating case that is enclosed in glass. Black metallic sheet that harnesses heat from solar radiation and transfers it to the coolant fluid. Cold coolant flows into the circulation tubes to absorb the solar energy trapped by the collector. Material placed on the back side of the collector to reduce heat loss. Tube containing a coolant (water, air) that is used to recover and carry heat to the absorbing plate. The coolant exits the collector at high temperature (up to about 80°C) and is stored or used immediately. 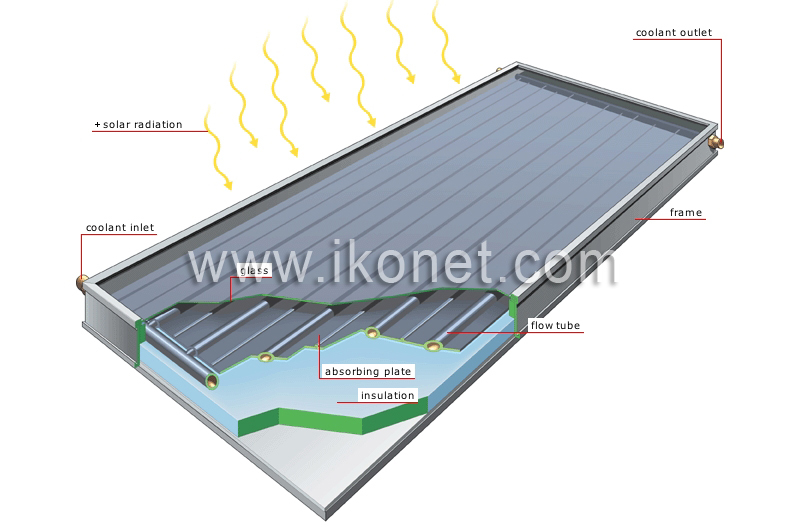 Translucent covering (glass, fiberglass, polycarbonate) that allows solar radiation to pass through; the heat produced is trapped in the collector.